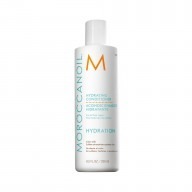 Get beautifully nourished hair whether you’re at home or away with the Moroccanoil Hydrate Travel Kit. Containing four must-have products in a handy travel pouch, the kit is a must-have for those with dry or coloured hair. The formula of the Hydrate Shampoo and Conditioner is enriched with vitamins A and E, argan oil and moisturising red algae to gently treat thirsty hair. The light version of the iconic Moroccanoil Treatment gives an added dose of hydration without weighing hair down, while the Dry Texture Spray adds shape and hold to undone, beachy styles.